The Britax Parkway has been a mainstay of the booster world for some time. This well-appointed, classic favorite booster seat received an update in 2013 that added some extra foam, additional padding, and SafeCell technology in the base. The Parkway SG-L comes equipped with lower anchor connectors which secure it to the vehicle. EPS foam– The Britax Parkway has EPS foam in the headrest and the torso wings; part of the True Side Impact protection designed to absorb energy in a crash. There is also comfort foam on the seat portion to make the ride more comfortable for the child. SafeCell technology – The base features SafeCell technology, developed by Britax, which also helps to absorb energy in a crash. You can learn more about SafeCell technology on the Britax website. SecureGuard – This optional, but recommended clip attaches to the seat pan of the booster. It helps to properly position the lap portion of the vehicle belt and helps prevent submarining under the vehicle seat belt in the event of a crash. Submarining happens when a passenger slides under the lap portion of the vehicle belt during a crash. While submarining is not a common occurrence, some families prefer this extra feature. Premium lower anchor connectors – These keep the booster more stable in the vehicle and secures the booster when unoccupied, preventing it from becoming a projectile in a crash. The Britax Parkway is straightforward to set up; simply place the booster on the vehicle seat then adjust the headrest using the one hand adjuster at the top of the seat. Then, once you’ve confirmed that the shoulder belt lies across the middle of the child’s shoulder, buckle the seat belt over the child. 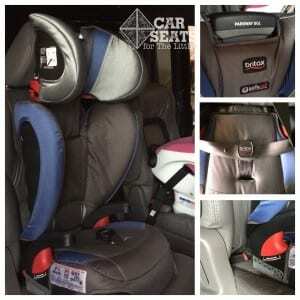 The headrest should be adjusted so that the shoulder belt guide falls just above the child’s shoulder. When the shoulder belt guide is no longer above the child’s shoulder, the seat can then be used in backless mode. The Parkway has a feature unique to booster seats, the SecureGuard. The SecureGuard is a clip that goes between the child’s legs and attaches to the lap portion of the seat belt. To use the SecureGuard, slide the lap portion of the seat belt into the clip before buckling the seat belt, then tighten the seat belt as usual. Use of the SecureGuard is optional, but recommended by Britax. The SecureGuard’s length can be adjusted by removing it from the seat and adjusting the strap. CSFTL recommends use of a high back booster as long as possible, as the structure of a high back helps children stay in position, especially when asleep, and offers the advantage of energy absorbing foam in the head and torso areas. This model s a smaller 5 year old, and only just meets the height and weight limits to ride in the Parkway. The back adjusts nicely so that the shoulder portion fits her smaller frame, and she could easily buckle and unbuckle herself. She needed help getting the belt into the SecureGuard clip, but she could get it out of the clip properly all on her own. The SecureGuard did help to improve the belt fit. Many 5 year olds still need to use a 5 point harness because they’re not ready to use a booster full-time. This model was a little too wiggly to use the Parkway full time, but she is learning to use a booster and can use it for short rides so she knows what is expected of her in the car. Booster training younger kids is a really helpful way to ease a child into using a booster. At age five, this little one could still be using a 5 point harness and some children this age are not mature enough to use a booster yet. Here we see a 7 year old model who is on the tall side for his age. He gets a good fit in the Parkway in high back mode. He likes the support he gets from the high back portion of the Parkway booster and has room to grow in it as the belt guides are tall and the limits are generous. He can easily use the SecureGuard clip and quickly buckles and unbuckles himself. While he loves that there are cup holders, and that they retract, he felt that they were harder to open and use than some other cupholders he’s used. With an adjustable backrest that allows for up to a 21.5″ torso height, the Parkway is one of the tallest high back boosters on the market. This allows for kids to use the high back several years longer than many other seats. Once the backrest is outgrown, the Parkway can be converted to a backless booster for children who weigh up to 120 pounds and are 63″ tall. Since the seating width between the armrests is a narrow 10″, it may not be comfortable for older children with wider hips. At a petite 41″ and 40 pounds, our 5 year old could use the Parkway without the back portion of the booster, according the stated height and weight limits. However, it’s clear from the photos that the shoulder belt is not touching her shoulder; this isn’t a safe fit. Since the Parkway SG-L doesn’t come with a shoulder belt adjuster, smaller kids like this model may not get always get a good fit without the back portion of the booster attached. Therefore, it is important to make sure your booster rider has a safe belt fit before moving to backless mode, including a vehicle head restraint behind their head. Our 7 year old is about the right age and size, 49 pounds and 50″, to start using a backless booster full time. He likes the Parkway without the back, but feels that the armrests are a little short. Even though he is a taller child, he’ll still need a booster seat for a few years to come. Expiration: The expiration date for the Parkway SG/SGL is six years from manufacture date. This is on page three of the manual. Date of manufacture/Manufacturer information: The date of manufacture sticker is under the manual in its storage spot on the bottom of the seat. FAA Approval: Like all belt positioning boosters, the Britax Parkway SG-L is not FAA approved because it requires a lap-shoulder belt. This is noted on a label on the side of the headrest. Even though it cannot be used on the plane, it’s still okay to bring it on as a carry-on item. The full seat is a little heavy, but the backless portion is fairly lightweight, so it’s easy to carry on the plane when flying with kids who still need a booster at your destination. Manual Storage: A handy storage pocket for the manual is right on the bottom of the base. The Parkway SG-L has been upgraded over its previous version. While there’s nothing wrong with something more basic, I do appreciate some of the bells and whistles that come with the Parkway. The headrest is easy to adjust, even the kids could do it. The belt guides are very open and allow the vehicle belt to move smoothly. Having the lower anchor connectors is something I really like because although they’re not necessary, they can make the drop off lane at school just a little easier. With the Britax Parkway SG-L, I don’t have to remember to buckle the booster back in after my kids get out of the car. We’ve actually used the Parkway SG-L in a seating position that does not have lower anchors, and it’s okay there, too, but we have to remember to buckle it when our children aren’t using it. I find the push-button lower anchor connects are really easy to attach to lower anchors in different vehicles. I also really like the fabric that covers the back of the Parkway when using the seat in backless mode. It covers the connector part for the high back portion of the seat nicely. Our opinions, as always, are all our own. Think the Parkway SG-L might be the right seat for your older Little? Find it at Amazon.com. « Keeping Yourself Safe, Too!